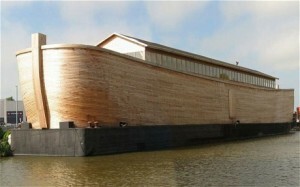 A life-sized replica of Noah’s ark has been built in the Netherlands and is now on display for public viewing. Dutch millionaire Johan Huibers says that the boat took four years for him to build, which mirrors the specifications outlined in the Bible. However, instead of Gopher wood, as mentioned in the Book of Genesis, he says that he used Swedish pine, which still qualifies as the resin wood outlined in the original instructions from God. According to reports, Huibers originally wanted to take the ark to the 2012 Olympics, but was unable to do so because of safety concerns. He says that he built the ark after having a dream about the Netherlands being flooded similar to the occurance in Noah’s day. In 2004, Huibers built a smaller replica, which attracted thousands of interested visitors. It is likely that his current museum, which features a few live birds in addition to plastic animals, will capture the attention of many more.